The Dogue de Bordeaux was known in France as early as the fourteenth century, particularly in southern France in the region around Bordeaux. Hence, the city lent its name to this large dog. A uniform breed type of the Bordeaux Dog did not exist before about 1920. "What am I supposed to do with a dog that has a monstrous skull and is at most able to carry it from the food dish to its bed?" The Dogue de Bordeaux was at one time known to come in two varieties, Dogues and Doguins, the Dogue being considerably larger than the Dougin. The smaller Doguin has withered away to nothing more than a mention in breed history books, as it is no longer in existence. The history of the breed is believed to predate the Bullmastiff and the Bulldog. It is said that the Dogue can be found in the background of the Bullmastiff, and others claim that the Dogue and Mastiff breeds were both being accomplished at the same time. Another theory is the Dogue de Bordeaux originates from the Tibetan Mastiff and it is also said that the Dogue is related to the Greco Roman molossoids used for war. 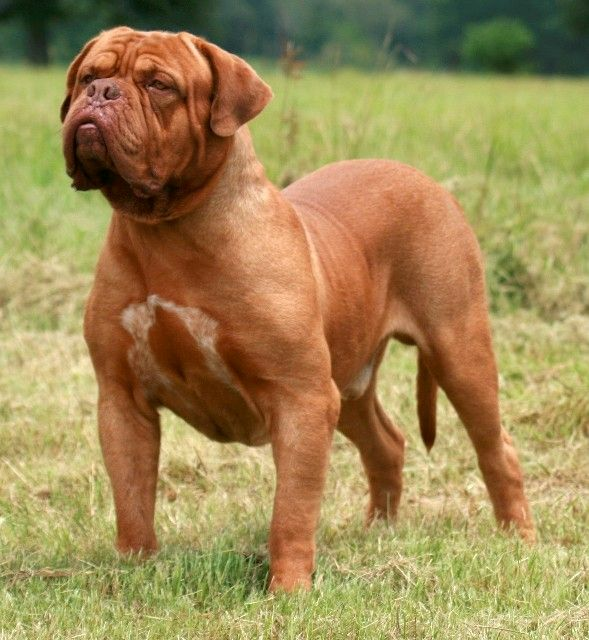 As there was a breed similar to the Dogue de Bordeaux in Rome at the time of Julius Caesar's reign, possibly a cousin of the Neapolitan Mastiff. Others suggest that the Dogue de Bordeaux is a descendent of a breed which existed in ancient France, the Dogues de Bordeaux of Aquitaine. Whichever theory is true, it is obvious that the Dogue de Bordeaux shares the same common links as all modern molossers. The Dogue de Bordeaux was once classified into three varieties, the Parisian, the Toulouse and the Bordeaux, types which were bred depending on the region of France and the jobs it was required to do. The ancestral Dogue de Bordeaux had various coat colors, such as brindle and a majority of white markings that carried fully up the legs. It had scissor bites in some regions, undershot in others; a big head or a small head, a large body or a small body; very inconsistent in type. Another controversial aspect was the mask, red (brown), none or black. The Dogue de Bordeaux of Bordeaux of the time also sported cropped ears. Regardless, it had a general type similar to today's Dogue de Bordeaux.